The Victron Quattro 10,000VA inverter chargers are one of the most powerful, flexible and easy to use power solutions on the market. Each fantastically well-made unit combines an advanced pure sinewave inverter with an incredibly powerful battery charger and power management system. The Victron Quattro inverter chargers are particularly well-suited to high-end remote power applications, from boats and yachts to military communications and power backup installations. The ability to take inputs from a mains connection, backup generator and DC batteries, then switch between the three seamlessly, makes the Quattro a 'must-have' product in the power management market. 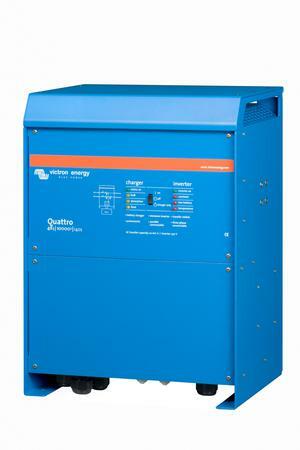 The Quattro can be connected to two independent AC sources, for example shorepower or the national grid, as well as a generator, or even two generators. Using the advanced transfer switch, the Quattro will automatically switch between sources should one or more of them fail. This all takes place within 12 milliseconds, with a very slight dip in voltage, so that 99.9% of electrical devices will not register the change. The main AC output is 'always on', whereas the secondary output is only active when the Victron Quattro is connected to an AC input source. This allows you to separate your electrical consumers into essential and non-essential groups. For example, it is advisable to connect water heaters or air-conditioning to the 'non-essential' AC2 connection. Up to 10 Victron Quattro inverter chargers can be set up to operate in parallel, so that ten 10000W units, for example, will provide 90kW - 100kW of usable power and a massive 1400A charging capacity. By connecting three Victron Quattro units together, they can supply a three-phase output. In addition, up to 10 trios can be operated in parallel, supplying up to 300kW of power and >4000A in battery charging! Since the Victron Quattro is a very powerful inverter charger, the maximum current draw from generator or shore-side sources can be limited. In this case, the Quattro will divert the necessary current to the operating devices, only feeding waht remains to the batteries. This prevents any overload on the AC sources. When the draw on the AC sources has been limited by PowerControl, the Quattro will 'boost' the available AC current with power from the battery bank. When power consumption falls below the limited AC input level, the Victron Quattro then stops drawing on the batteries and instead returns to using surplus AC input power to recharge the batteries. 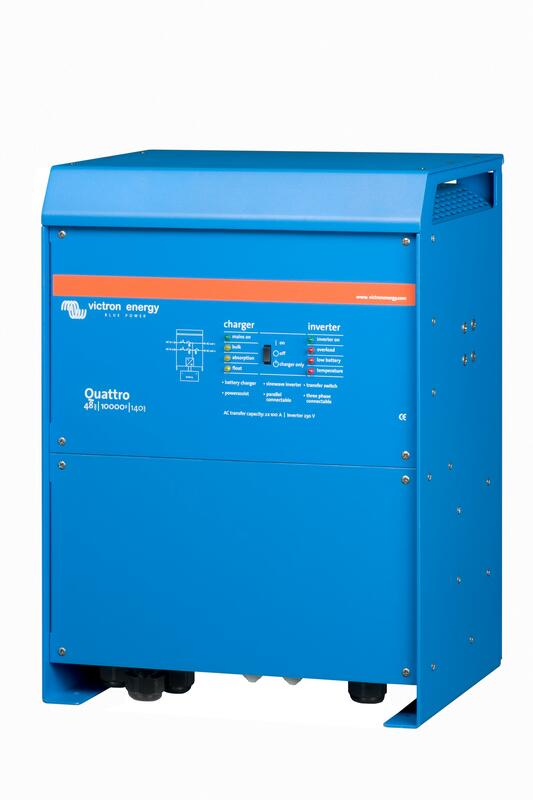 The Quattro can be used in off grid as well as grid connected PV systems.